These days with oil prices dropping more everyday, some people are returning to oil fired boilers to heat their homes. There are hundreds of them on the market, how do you choose? There are three oil-fired boilers that are at the top of that list; they are from three of the leading companies in oil-fired boilers today, Weil McLain, Buderus and Utica. Here is a look at what each of the boilers has to offer, and then you can decide for yourself which boiler you want to have safely and efficiently heat your home. The Weil McLain Gold Series Oil Fired Steam Boiler, Model SGO. 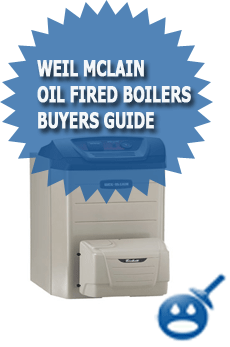 This oil-fired boiler is one Weil McLain’s best selling boilers. There are eight different models each one with more capacity than the next. What sets this boiler apart from the others is that the SGO has larger water content than other other boilers. What this means for you is that with more water the more steam you are going to get and the more heat you are going to get. Each of these boilers has an efficiency rating of 85% and higher. The heating capacity of the SGO oil fired boilers range from 114,000 to 295,000Btu’s and a Net IBR Rating Range from 354,000 to 921,000. The boiler sections are made from Cast Iron. With the combination of cast iron boiler sections and a special elastomer sealant these boilers are more efficient than ever. The Weil McLain Gold Series Oil Fired Steam Boilers are insulated with a Steel Jacket; this design was created to help keep the heat in. The boiler is compact and can easily be installed in any size basement or boiler room. The Weil McLain Gold Series Oil Fired Steam Boiler is efficient and one of the safest oil fired boilers around. Prices will vary all depending on where you purchase the boiler. The SGO Oil Fired Boilers is priced around $ 4500.00. You could buy them from a local Weil McLain Distributor or from your local HVAC Company. You want to make sure that you are getting an all-inclusive price, nothing extra including all shipping charges. It is important to shop around; you may be able to get a great deal. 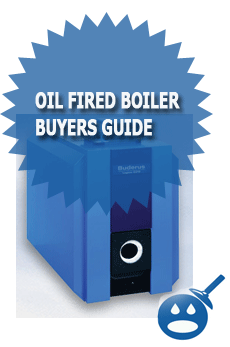 If Weil McLain does not have what you are looking for, how about a Buderus G215 Oil Fired Residential Boiler. The G215 Oil Fired Boiler has an Energy Star Rating of 86% plus. When you see the blue Energy Star Sticker you know the product has to be efficient. This oil-fired boiler uses a 3-pass system; this means that the system gives 3 different ways for the flue gases to heat up the system. 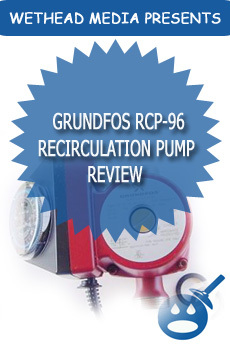 The Buderus G215 is also insulated with 3″ of a thick thermal insulation. This insulation will keep the boiler water at a hot temperature even when the boiler is on standby. The G215 is a low NOx emissions boiler and this means that there are less emissions getting out into the environment. This boiler’s design was created with the service technician in mind. The G215 has a full swing out for easy maintenance and inspection. This boiler is safe, efficient and uses a 3 pass system while others are single pass. 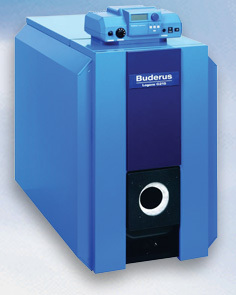 The Buderus G215 Boiler is priced between $2500.00 and $3500.00. These prices will vary, depending on where you buy the boiler. You can get some really great deals on the Buderus G215 by shopping online or talking to the Buderus Boiler in your area. Make sure that the price includes shipping; some companies try to make more money off of the shipping costs. Do some research and get the best prices that you can. It will be well worth it. The last oil-fired boiler in the top three is the Utica TriFire Oil Fired Boiler. Just like the Buderus G215 Boiler, the TriFire uses a 3-pass system to ensure the best efficiency that you can get from a boiler. The TriFire has an Energy Star Rating of 86.5%. There are 4 models in the TriFire System; each boiler has a better heating capacity than the next. The Series has an Input MBH range of 105,000 to 231,000 MBH. The Utica Boiler Company makes it easy to install, the TriFire Series has a Piping Tree, this tree that is labeled exactly where the piping is going to be connected. The tree has a section for the piping of the AquaStats, Relief Valves and the Temperature and Pressure Gauges. Some standard features of the TriFire Oil Fired Boiler are the flexible oil lines, site glasses and a sample port. All three of these things make maintenance on system much easier. It is important to read all of the manuals that come with the boilers. You should know what the gauges should be set at and when you can tell if something isn’t right. Utica has been serving the industry since 1928; they know quality parts as well as 100% safe and efficient products. The prices for a Utica TriFire Boiler are around $2800 to $3500.00. These prices will vary. You really have to shop around, some places online can offer you much lower prices because they have no overhead and other prices may run on target. When you buy something as big as a boiler you want to do as much research as you can. If you have any questions, contact your local Utica Boiler Rep.
Hi there, You have done a fantastic job with such a great research and all the repair tips here. I will certainly review them and personally recommend to my friends. I’m sure they will be benefited from this web site.